My first JT65 QSO on 1296 MHz ever. Rex VK7MO has small dish and around 150W RF power. Using septum feed a TVRO on balcony. Picture and more details here with QSL from Rex. Signal was speaker copy and possible to work CW easy. Good way for small stations how to work via Moon on 23cm too. Here you can see on the Spectran, how is signal drifting due to Doppler. 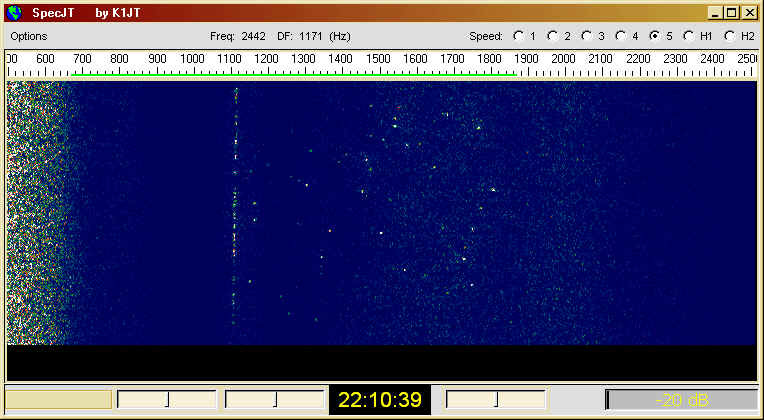 With last version of JT65 is decoding signal -17dB and spectran much better visible. Here is the .wav file for possible downloading and try to decode in your PC or try to hear speaker copy signal. For height to get above balcony rails at low elevation. Towards EU I am obstructed by my own house and also trees so I can only get a good window when the moon is at Northerly declination 23 to 25 degrees and between 215 and 230 west above 12 degrees elevation at my end. So Eu contacts are restricted to a few hours per month. Dish lays flat and is moved back against house when not in use so it is visible to neighbors. The station must be set up for each sked. The shack is 20 meters away at back of house so I must walk through house to direct antenna every few TX/RX periods. IC-910-H which is GPS locked. The 30.2 MHz reference for IC-910-H is provided by a HP 3325a synthesizer which is locked to a HP Z3801a GPS frequency reference. Measured drift against a Rubidium reference was 4 milli-Hz at 1296 MHz over 2 months. I have worked HB9Q, K2UYH, VK4AFL, VA7MM, VE7BBG, W5LUA, WW2R, G4CCH, OE9ERC, VE6TA, SM5LE, JA6AHB, OK1KIR, OH3MCK, OK1DFC on JT65c and WA6PY and G4CCH on CW. My smallest station is OH3MCK who was using 27 dBi horizontally polarized Yagi or equivalent of 24 dBi to my circular polarization. I have worked VK4AFL (3.7 meter dish) at 10 watts and he can copy me at 5 watts. My interest is in QRP EME and I need to find the extra few dB on RX. I think the secret to QRP EME on 1296 is frequency stability as provided by my GPS locked system. I would like to carry out my QRP experiments with other GPS locked stations. The next step is to compensate for Doppler shift so I need some help to find a program that will correct the tuning of my IC-910-H for Doppler.